Do you have a minute to spare to learn some English? Sam's telling us the difference between remember to do and remember doing. Let's hope we remember! Give us 60 seconds and we'll give you the English! Welcome, everyone! Sam from BBC Learning English here. You probably already know that in English we have some verbs that are always followed by the infinitive – for example: want. And other verbs that are always followed by the gerund - for example: enjoy. Remember to bring your umbrella - where first you remember and then you bring your umbrella. This is commonly used when talking about the future. I remember meeting my best friend when I was little - where first I met my best friend and then I remembered it. This is now a memory, so it's commonly used when talking about the past. In English, when two verbs are used together the first verb tells the second verb what form to take. Some verbs are always followed by an infinitive verb, others are followed by a gerund - an ING verb. In some cases a verb can use either an infinitive or gerund and the choice can make a difference in meaning. I enjoy going to the cinema. I stopped to go to the cinema. I stopped going to the cinema. Remember can be followed by an infinitive or a gerund and there is a difference in meaning. I need to remember to go shopping. I remember going shopping this morning. When we follow remember with an infinitive, we remember first and then do the action second. This is commonly used to talk about the future - especially when we need to remember to do something later - such as shopping! Remember to bring your umbrella. She needs to remember to finish her homework before 4pm. I must remember to go shopping later - we have no food! When we follow remember with a gerund, we do the action first and then later remember it. The action is a memory and this form is commonly used to talk about the past. Can you remember going fishing with Dad when we were six? Before she left she told me that she remembered baking cakes with you. It is her favourite memory. Sam mentioned the verbs want, enjoy and remember. Which one was followed by an infinitive? Which of these verbs is always followed by an infinitive? 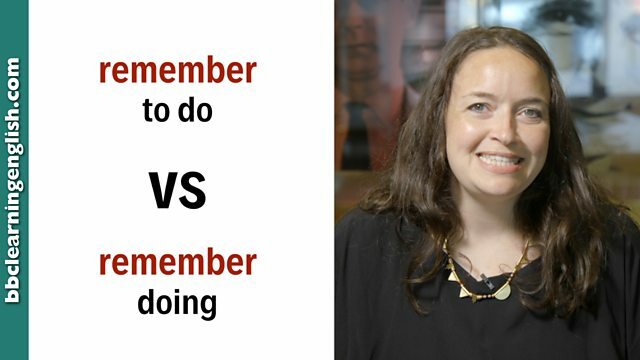 Sam mentioned that remember could be used with an infinitive or a gerund, but was there a difference? True or false: Remember can be used with an infinitive or gerund with no difference in meaning. Remember + infinitive is for the future, remember + gerund is for the past.